The Sun on Sunday is to publish for the first time next weekend, News International has announced. An email to all staff said that Rupert Murdoch, boss of parent company News Corporation, would "be staying in London to oversee the launch". Mr Murdoch flew in to the UK last week, and told Sun staff that a Sunday edition would be launched "very soon". News International shut down its Sunday paper, the News of the World, last year amid the scandal over phone hacking. There had been speculation about the possibility of a Sunday edition of the Sun since then, said BBC media correspondent Torin Douglas. A gap in the market had been left by the News of the World's closure, he said, but as tabloid sales were declining it was unclear how much demand there was for the Sun for an extra day a week. The internal memo from News International chief executive Tom Mockridge said: "As you know, News Corporation has made clear its determination to sort out what has gone wrong in the past and we are fundamentally changing how we operate as a business. "The commitment of News Corporation to invest in a new edition is the strongest possible message of support we could wish for." He went on: "This is our moment. I am sure every one of us will seize the opportunity to pull together and deliver a great new dawn for the Sun this Sunday." A report on the Sun website quoted editor Dominic Mohan as saying: "This is a truly historic moment in newspaper publishing and I am proud to be part of it." Speaking to BBC News, former News of the World TV editor Tom Latchem said he expected the new paper to sell well. "Certainly, there is no newspaper at the moment that comes close on a Sunday to matching what the News of the World was able to do, not only in the size of its readership but the money that was spent on it," he said. "The Sun has got a remarkably loyal readership. I think [former News of the World readers] will go back to the Sun on Sunday. "Whether you like the Sun or whether you like the News of the World or whether you don't, it's a great move for British newspaper journalism at a time when sales and advertising revenue are dwindling." 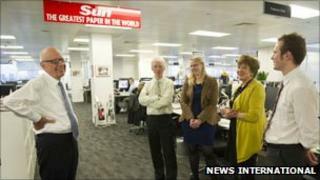 On a visit to News International's headquarters in Wapping, east London, on Thursday, Mr Murdoch pledged "unwavering support" for his journalists. Since last November, 10 current and former Sun senior reporters and executives have been arrested over alleged corrupt payments to public officials. Anger has been expressed by some Sun staff at the decision of News Corporation's management and standards committee - set up to investigate allegations of wrongdoing - to pass information to the police. Trevor Kavanagh, the paper's associate editor told the BBC the paper's publisher, News International, was the subject of a "witch-hunt" and the arrest of journalists at the paper as part of the police investigation was "disproportionate". "There are journalists in every other newspaper, including those leading the charge against us, who deploy exactly the same methods and procedures of trying to unearth stories which are in the public interest," he said. Last week, Mr Murdoch lifted the suspensions of the arrested workers, but said their detentions had been a "great source of pain", adding: "Illegal activities simply cannot and will not be tolerated." A number of people have contacted the BBC to express their views on the new newspaper. Graham Forsyth, from Chard, in Somerset, said the Sun had "perverted democracy" and took "populist views", while providing "no balance". "I wouldn't buy the Sun on Sunday. The Sun is feeding a dislike and hatred of any socialist policies - it's almost like the Tea Party in the [United] States," he said. But Raymond Morris, from Luton, took a different view. He used to buy the News of the World and said he felt other Sunday newspapers were "boring". Mr Morris told the BBC: "When it comes to phone hacking it doesn't really affect me or bother me. It wasn't very nice, was it? But if one paper does it maybe other papers do it too. "Thank God for the the Sun on Sunday: I can't wait, well done." Could Murdoch's bold Sunday tabloid move pay off?